During the Annual Council meeting on Thursday 18 May 2017 Councillor Nick Farrar was successfully confirmed as Hayle Town Mayor and Councillor Clive Polkinghorne as Hayle Deputy Mayor for the forthcoming year. Congratulations to both! 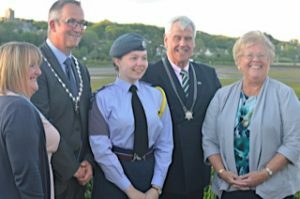 At the same meeting Maddie Thomas was chosen as the Mayor’s Cadet for 2017-2018.